The latest installment in the Indiana Jones trilogy opened this week, Indiana Jones and the Kingdom of the Crystal Skull over 18 years after the last installment, The Last Crusade. To commemorate this much-awaited summer blockbuster, I've decided to review all four of the films together. Raiders of the Lost Ark is the film that started it all. Taking off on cliffhanger B-movies of yesteryears, George Lucas and Steven Spielberg (together with screenwriter Philip Kaufman) created this unique character, an archaeologist who travels the world hunting for legendary artifacts while evading bad guys who want the same artifacts for evil. The film pretty much wrote the formula for summer blockbuster movies: Combining tongue in cheek humor, outrageous action sequences and scary scenes all within the context of a rather preposterous, fantastical plot. The first film, Raiders of the Lost Ark, did it splendidly. Archaeologist Dr. Henry 'Indiana' Jones battle it out with Nazis to find the Ark of the Covenant. It defined a genre, spawning a lot of pale imitations. It truly defined the modern-day escapist film genre. From it's now often imitated opening sequence to that horrific/ghoulishly fun sequence of melting Nazis, it still holds up well through repeated viewings. The often-maligned second film of the trilogy The Temple of Doom is oddly enough one of the most underrated. 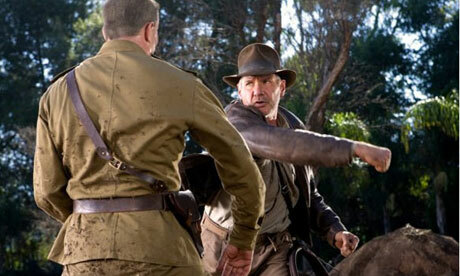 This time around, Indy battles a cult who enslaves children to pursue the power of legendary stones. People have complained about how they were annoyed by Short Round and angered by the ditziness of Willie Scott and by the apparent ethnocentrism leveled against Hindus but in the end, it really is a fun, solid action adventure film that's still way better than most films which try to imitate it. A mess? Yes, but a fun mess. The third film of the original trilogy, The Last Crusade teams up Jones with his father to search for the Holy Grail. Sean Connery played the elder Henry Jones and part of the film's success was his on-screen chemistry with Harrison Ford. He definitely gave the series extra humor and pathos. Many people say this was an improvement to The Temple of Doom. I beg to differ. On hindsight, I would say that they're pretty much equal in terms of quality. Both pale in comparison to the original film. 18 years and several false starts and rewrites later, here comes Indiana Jones and the Kingdom of the Crystal Skull. And I have to say that this is probably the weakest of the entries to this franchise. Yes, it does contain some elements that made the original trilogy fun: The swordfight between Cate Blanchett and Shia LaBeouf between two speeding vehicles is a particular highlight but the film suffers from two elements: The introduction of CGI and the story. Part of what makes the first three films exciting and new is the fact that they were made in the 1980's and that most of the stunts featured are live. CGI has spoiled this genre because you can literally think of anything and it could happen. Before CGI, people actually gave thought as to what stunts they can do live which gave it room for more creativity. CGI is also part of the reason why a lot of Indy movie wannabes like National Treasure and The Mummy movies don't work as well. The story of Crystal Skull is pretty preposterous: Aliens ruling an ancient South American civilization? Please. Granted, the other plots of the other Indy movies are fantastical, this type of fantastical does not belong in an Indiana Jones movie. The movie, however, tried it's darndest to capture the spirit of the original trilogy and it sometimes works, admittedly but it's still a very disappointing far cry from it. I'm a thirtysomething Filipino writer. And this is my blog.